I’m moving sluggishly slow through the current reading. After weeks of trying to fit it into my schedule, I have a third of the book to show for my effort. Still, it’s given me a great deal to think about, and all of the resulting questions are new topics of discussion between me and my psychiatrist. Earlier, I said that I wouldn’t be writing on this book until I finished it. After the last post, I changed my mind. “If we have treatments that effectively address these disorders, why has mental illness become an ever-greater health problem in the United States?” (12). The findings presented center (at least thus far) around what psychopharmaceuticals actually do to the brain in the short and long term. That is not what I’m going to talk about here. “From a scientific point of view, it is apparent today that the chemical imbalance hypothesis was always wobbly in kind, and many of the scientists who watched its rise and fall have looked back on it with a bit of embarrassment” (75). “Yet a societal belief in chemical imbalances has remained (for reasons that will be explored later), and it has led those who have investigated and written about this history to emphasize, time and again, the same bottom-line conclusion. ‘The evidence does not support any of the biochemical theories of mental illness,’ concluded Elliot Valenstein, a professor of neuroscience at the University of Michigan, in his 1998 book Blaming the Brain” (75). 1998? 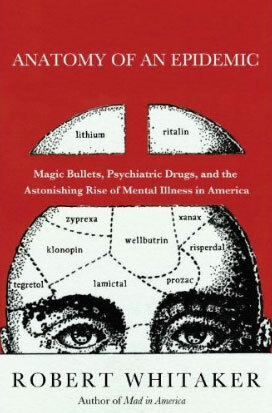 It’s 2011, and “chemical imbalance” is still touted as the cause of mental illness. Valenstein is not the only one quoted in that paragraph. Among others, U.S. surgeon general David Satcher has said the same thing. Ever wonder why it takes rounds of trial-and-error to find a meds regimen that works for you? It seems to be because those meds affect your brain chemistry, and your brain chemistry is not the cause of mental illness. (In fact, there is also an undeniable amount of evidence supporting the claim that the CHEMICALS of a MI brain are pretty much just as balanced as those in a ‘normal’ brain.) At best, when they work, meds affect our symptoms right now. They do nothing to reverse or curb or change or alleviate the cause. Now, don’t get me wrong: my symptoms need to be addressed, even when we don’t know the cause, to help me live my life the way I want to. But don’t lie to me about it. I have said many times that I am lucky to have my doctor. She doesn’t lie to me. I asked her these questions, and she told me that “chemical imbalance” is code and, in and of itself, is a meaningless and empty phrase. I’m becoming skeptical. I’m becoming worried. I’m becoming angry with the pharmaceutical industry whose products I rely on daily. As I progress through Whitaker’s book, I’m reading about the research surrounding the long-term prognosis for patients whose brain chemistry is being irreversibly altered by these drugs. I will continue to take my meds, but I want some truth. I feel lied to. I am not a child, and I don’t need the dumbed-down version. Don’t tell me my brain is broken until you actually know that it is. Until then, I will tell you when it feels not-quite-up-to-par. Don’t tell me we know the biological root cause when we clearly don’t. Don’t tell me all this because you think it will make me compliant or you think a little white lie will make me feel better about myself. Don’t tell me my medication is “fixing” anything. My antipsychotics are anti-“psychotic behavior.” They are not anti-psychosis. There is a difference. ok, this time I got the 5 stars in. Awesome writing AGAIN. So awesome that I’m only commenting because I always do and I can’t avoid it. I know I’m sounding stupid but what do you say to what you wrote? It’s perfectly presented. You must have recently had an appt. But as you know from my recent post: http://thedailybipolar.blogspot.com/2011/02/spending-time-thinking-uh-oh.html, I’m ANGRY, too! At the incestuous relationship between the pharmaceuticals and the research on MI. Thanks for posting! For readers out there, I should probably let you know that the question of meds started in part with a poll on meds, followed by a couple posts with handful of comments on Meredith’s blog (here and here). WTF? So, my illness isn’t because my brain reuptakes seretonin/dopamine too fast??? Hold the phone. That is what my MI self is thinking. Side note: I got my new meds. Haven’t taken them yet, but I have them. Sorry to be the one to fill you in on this apparent lie. It seems quite likely that you didn’t reuptake anything too fast. It just seems that slowing your very normal reuptake speed down just produces some desired effects. Symptoms and causes. Symptoms and causes. Thanks for the compliment. I try. I feel like if you guys are going to take the time to read what I throw out there, then the least I can do is make it worth reading. I didn’t answer the question in my post lauding your post. I enjoyed Alan’s randomness. I also believed it was a chemical imbalance and even tried to keep convincing you of it, painfully so, after you told me Whitaker said it wasn’t. However, it seems that if it isn’t a chemical imbalance, it would be easier to search for the source. Let the real research begin!!! Onward! I believe my MI is caused by a chemical imbalance and then episodes usually come about because some stressor. I say this because when I was rapid cycling in 2004, I could pinpoint exactly when my mood changed, and I wasn’t doing anything stressful, or any other environmental factor that could affect it. For example, I was playing the drums, and my mood was okay (or maybe hypomanic) and then all of a sudden, I got depressed. I was depressed for about a week and then switched back. Just my thoughts, for me personally. I totally agree that something biological is going on, but from what I’ve read in the last few months, there’s actually no evidence that chemical imbalances are to blame. In fact, there’s substantial research showing that the chemical levels of an MI brain are not statistically different than a non-MI brain. Personally (while I have admittedly minimal reason to know this) I’m more inclined to believe that the root is neuroelectric rather than neurochemical. I base this partially on the kindling hypothesis and the fact that anti-convulsants (lamictal, depakote, etc) have been found effective (at least in bipolar).